At the Virginia Historical Society, Kimmy Drudge, a 14-year-old from Chesterfield County who is visually impaired and a massive Star Wars fan, is about to “see” — but with her hands — George Washington’s signature from a letter written in 1775. “This is it! This is it!” she says, bouncing with excitement. Andrew Talkov, vice president for programs at the Richmond museum, hands Drudge a 3-D-printed version of Washington’s signature, produced a week earlier in Virginia Commonwealth University’s Virtual Curation Laboratory. 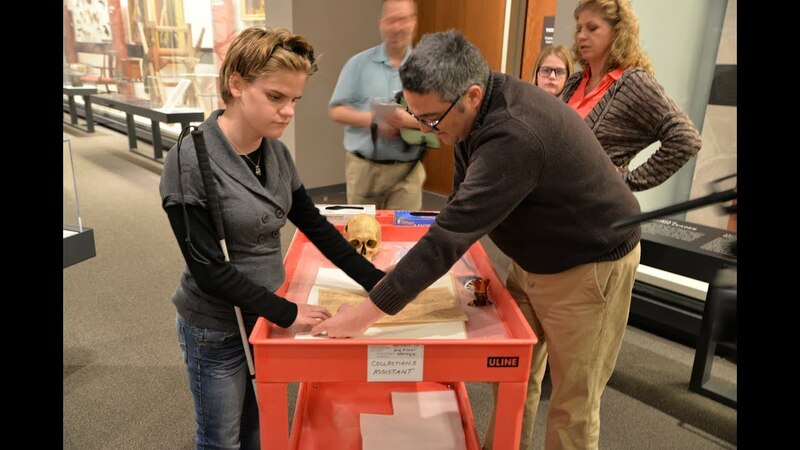 A few weeks back, Talkov contacted Bernard Means, Ph.D., director of the Virtual Curation Laboratory — which 3-D scans and prints historic artifacts — with a question: Could 3-D printing help the Virginia Historical Society make its collections more accessible to people with visual impairment? “I’m trying to figure out how we can use 3-D printing to make the experience better for everybody — because who doesn’t want to be able to handle the [artifact] that’s behind the glass, even if it’s just a reproduction — but specifically for the visually impaired,” Talkov said. Means said he was excited for the opportunity, and invited Talkov to his lab in the Franklin Street Gym. This is actually touching George Washington’s signature. Over the coming days, Means would 3-D scan and print a number of artifacts on display in the museum’s Story of Virginia exhibition, including a 1622 iron breastplate on loan from the Virginia Department of Historic Resources, a 1924 cigar store Indian, a wheel from a Conestoga wagon and George Washington’s signature from a letter he wrote to his stepson, in which he discusses his accepting command of the Continental Army. “The idea behind 3-D printing a signature is that you can tell people that George Washington signed this document, but even if you could hold the real thing — which, of course, you can’t, [because] it’s too fragile — it’s not going to mean anything to you if you’re visually impaired. Even if you translate that document into braille, you’re getting a translation of that document,” said Means, a professor in the School of World Studies in theCollege of Humanities and Sciences. Kimmy Drudge (left), a visually impaired 14-year-old, feels George Washington's signature, 3-D printed at a VCU lab off of a document at the Virginia Historical Society. Drudge visited the Virginia Historical Society on a recent afternoon to test out the 3-D-printed prototype artifacts, and to see if she enjoyed the experience and whether they would accurately convey a sense of the real thing. After she checked out the 3-D-printed signature, Talkov handed her a tiny 3-D-printed replica of the iron breastplate. “This is a piece of armor that you would wear on your chest,” Talkov said. “That doesn’t feel like metal at all,” she said. Drudge feels George Washington's signature on a 3-D-printed artifact. Drudge’s mom, Dawn Peifer, is president of the Virginia Association for Parents of Children with Visual Impairment and works at the Partnership for People with Disabilities at VCU’s School of Education. As she watched her daughter interact with the 3-D-printed artifacts, she said it is fantastic to see museums working to make their collections more accessible to people with visual impairment. “Any steps that are taken [to make museums more accessible to the visually impaired] are huge,” she said. Their family, Peifer said, had stopped visiting museums altogether. “To my daughter, a visit to a museum was always just the experience of walking around a building touching glass cases while mom talked, describing the contents,” she said. For her daughter to be able to touch objects at museums would make the experience far more meaningful and educational. Not all of the artifacts that Drudge tested were from the Virginia Historical Society’s collection. Means brought along a variety of objects he’s scanned at other museums and historic sites and then 3-D printed, including a wig curler used for one of George Washington’s brothers, the world’s oldest peanut, an Aztec figurine of a dog from the 1500s, and a “rosette” of two bullets that collided in the Civil War. “It’s two bullets that hit in mid-air, that became one when two soldiers were shooting at one another in the Civil War,” Means said. Means told Drudge she could keep all of the 3-D printed artifacts, including the signature and the bullet. I think he’s a Jedi Master. The Jedi Master of 3-D printing. Subscribe for free to the weekly VCU News email newsletter at http://newsletter.news.vcu.edu/ and receive a selection of stories, videos, photos, news clips and event listings in your inbox every Thursday. VCU professor Bernard Means 3-D scanned and printed a 1924 cigar store figure with African-American facial features and Native American dress, which is on display at the Virginia Historical Society.